"We're taking real tools from biology and applying them in a super serious way. I hope people find the humor in this," says the Charles Hansen Professor of Anthropology. Prof. Dominy's new paper: "Dr. Seuss and the real Lorax"
The paper released on July 23, 2018, in the prestigious journal Nature Ecology & Evolution, has been featured in the New York Times and the Washington Post among many other media outlets. The paper published in the ISME Journal stems from work by Jill Britton ’14, Katie Amato ’07, and Charles Hansen Professor of Anthropology Nathaniel J. Dominy. 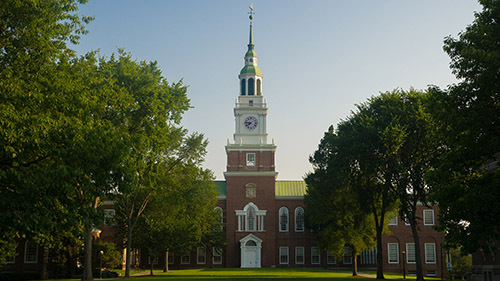 Dartmouth News article, published on July 10, 2018 by Joseph Blumberg, about Prof. DeSilva's new study. “Every so often, we find a fragmentary piece of a kid’s mandible, or some teeth. But this discovery is just extraordinary.” Jeremy DeSilva quoted in The Atlantic article about his recently published study. The article titled, "Foot of 'World's Oldest Child' Shows How Our Ancestors Moved", features lead author Jeremy DeSilva's study published in Science Advances. The honors project culminates in a substantial independent thesis supervised by a primary faculty advisor. The 2017-18 submissions had varied and interesting topics. Jeremy DeSilva, associate professor of anthropology at Dartmouth College, and Briana Pobiner, paleoanthropologist at the Smithsonian Institution, co-instructed a free online course on bipedalism. Veer Ecology A Companion for Environmental Thinking from University of Minnesota Press. Yulia Averkieva and Franz Boas: Mutual Affection and Ideological Disagreements. Explore the early history of Dartmouth through an archaeological excavation at an 18th-century house site on campus.